There is a lot happening in this chart. First of all we have TWO grand trines ( everyone else has only one — we Maritimers are special! ) The one we share with everyone else is The Moon, Saturn And Uranus. The Moon is at Her showy best in Leo in the Eleventh House of Elected Office and government. it is in harmony with Uranus (shock and upset) in the Seventh House of disputes and treaties and also in harmony with the Third House Saturn, (the strict administration or suppression of education, propaganda and the media) So I guess we will not be having the teachers’ strike we were expecting this lunar cycle. 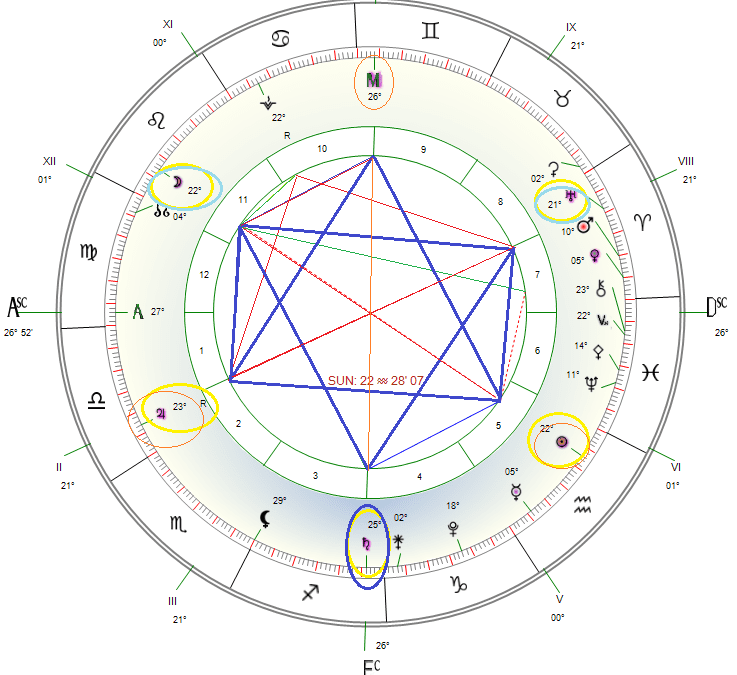 The second Grand Trine is in Air ( Gemini, Libra and Aquarius ) and features The MC ( the ruling class) , Jupiter ( again the upper classes) and the Sun ( the centre of authority). All this leadership is taking place in the houses of the aspirations of the people (10th), the self image of the people(1st) and the arts, leisure and our children (5th) so the pressure is on the ruling parties to act in a manner in keeping with the Maritime way of doing business whilst protecting our young people. As this is a trine, it would appear they will keep their shirts tucked in, at least for the duration of this cycle. In both cases we have a Righteousness Rectangle tucked inside those happy-looking trines. This is an indication that while we have smooth sailing on the surface, there is a great deal more tension in government under the covers than we are privy to understand. If tensions are not carefully and respectfully managed, those who are ruled could well “blow a gasket” before the lunar cycle is complete. If you have planets, especially the Sun or the Moon, at 22 degrees of Fire or Air, this will be a bit of a whirlwind time for you. Have fun by all means, but remember this is a cycle and it will pass. Before making any long-term decisions, maybe find a friend with nothing at 22 degrees of anything and see if they agree with you! With Jupiter now headed backwards in the sky and Venus soon to follow, this is a great time to count our blessings and to reach out and support others who are less fortunate. Retrograde motion may frustrate the “high fliers” but to those who are on the soul’s journey they are gifts of space and time to reflect.